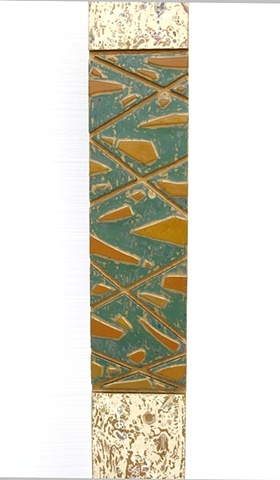 Delos Van Earl Studios - "Goldenbrook Stele"
86" X 7" X 10"
Dappled ivory and gold stele with band of green and gold glass with gold lines. Beautiful seed distribution on the body of the stele, and beautiful glass and line work on the totem aspect. On a painted gold wooden base.